Published in L. Frank Baum's first children's book, Mother Goose in Prose (1897), illustrated by Maxfield Parrish. You might also enjoy the Mother Goose collection of nursery rhymes, including Hark, Hark, the Dogs Do Bark. Well might any father be proud of so manly and beautiful a child, and the King's heart swelled within him as he gazed upon his heir. "Borland," he said to the tutor, who stood modestly behind the Prince, "you may retire. I wish to sneak privately with his royal highness." "Come here, Lilimond, and sit beside me. Methinks you seem over-grave this morning." "It is my birthday, Your Majesty," replied the Prince, as he slowly obeyed his father and sat beside him upon the rich broidered cushions of the throne. "I am twelve years of age." "So old!" said the King, smiling into the little face that was raised to his. "And is it the weight of years that makes you sad?" "No, Your Majesty; I long for the years to pass, that I may become a man, and take my part in the world's affairs. It is the sad condition of my country which troubles me." "Indeed!" exclaimed the King, casting a keen glance at his son. "Are you becoming interested in politics, then; or is there some grievous breach of court etiquette which has attracted your attention?" "I know little of politics and less of the court, sire," replied Lilimond; "it is the distress of the people that worries me." "The people? Of a surety, Prince, you are better posted than am I, since of the people and their affairs I know nothing at all. I have appointed officers to look after their interests, and therefore I have no cause to come into contact with them myself. But what is amiss?" "They are starving," said the Prince, looking at his father very seriously; "the country is filled with beggars, who appeal for charity, since they are unable otherwise to procure food." "Starving!" repeated the King; "surely you are misinformed. My Lord Chamberlain told me but this morning the people were loyal and contented, and my Lord of the Treasury reports that all taxes and tithes have been paid, and my coffers are running over." "Your Lord Chamberlain is wrong, sire," returned the Prince; "my tutor, Borland, and I have talked with many of these beggars the past few days, and we find the tithes and taxes which have enriched you have taken the bread from their wives and children." "So!" exclaimed the King. "We must examine into this matter." He touched a bell beside him, and when a retainer appeared directed his Chamberlain and his Treasurer to wait upon him at once. "Sir, I am informed my people are murmuring at my injustice. Is it true?" "The people always murmur, Your Majesty. They are many, and not all can be content, even when ruled by so wise and just a King. In every land and in every age there are those who rebel against the laws, and the protests of the few are ever heard above the contentment of the many." "I am told," continued the King, severely, "that my country is overrun with beggars, who suffer for lack of the bread we have taken from them by our taxations. Is this true?" "There are always beggars, Your Majesty, in every country," replied the Chamberlain, "and it is their custom to blame others for their own misfortunes." "Do we tax the poor?" he demanded. "All are taxed, sire," returned the Treasurer, who was pale from anxiety, for never before had the King so questioned him, "but from the rich we take much, from the poor very little." "But a little from the poor man may distress him, while the rich subject would never feel the loss. Why do we tax the poor at all?" "Because, Your Majesty, should we declare the poor free from taxation all your subjects would at once claim to be poor, and the royal treasury would remain empty. And as none are so rich but there are those richer, how should we, in justice, determine which are the rich and which are the poor?" "You have heard the wise words of my councilors, Prince. What have you to say in reply?" "If you will pardon me, Your Majesty, I think you are wrong to leave the affairs of the people to others to direct. If you knew them as well as I do, you would distrust the words of your councilors, who naturally fear your anger more than they do that of your subjects." "If they fear my anger they will be careful to do no injustice to my people. Surely you cannot expect me to attend to levying the taxes myself," continued the King, with growing annoyance. "What are my officers for, but to serve me?" "They should serve you, it is true," replied the Prince, thoughtfully, "but they should serve the people as well." "Nonsense!" answered the King; "you are too young as yet to properly understand such matters. And it is a way youth has to imagine it is wiser than age and experience combined. Still, I will investigate the subject further, and see that justice is done the poor." "In the meantime," said the Prince, "many will starve to death. Can you not assist these poor beggars at once?" "In what way?" demanded the King. "By giving them money from your full coffers." "Nonsense!" again cried the King, this time with real anger; "you have heard what the Chamberlain said: we always have beggars, and none, as yet, have starved to death. Besides, I must use the money for the grand ball and tourney next month, as I have promised the ladies of the court a carnival of unusual magnificence." "Let us dismiss this subject, Lilimond, for it only serves to distress us both, and no good can come of it. You have nearly made me forget it is your birthday. Now listen, my son: I am much pleased with you, and thank God that he has given me such a successor for my crown, for I perceive your mind is as beautiful as your person, and that you will in time be fitted to rule the land with wisdom and justice. Therefore I promise, in honor of your birthday, to grant any desire you may express, provided it lies within my power. Nor will I make any further condition, since I rely upon your judgment to select some gift I may be glad to bestow." "Call in the ladies and gentlemen of the court, my father, and before them all will I claim your promise." "Good!" exclaimed the King, who looked for some amusement in his son's request; and at once he ordered the court to assemble. "His Majesty the King, whose kindness of heart and royal condescension is well known to you all, hath but now promised me, seeing that it is my birthday, to grant any one request that I may prefer. Is it not true, Your Majesty?" "It is true," answered the King, smiling upon his son, and pleased to see him addressing the court so gravely and with so manly an air; "whatsoever the Prince may ask, that will I freely grant." "Then, oh sire," said the Prince, kneeling before the throne, "I ask that for the period of one day I may reign as King in your stead, having at my command all kingly power and the obedience of all who owe allegiance to the crown!" "For a time there was perfect silence in the court, the King growing red with dismay and embarrassment and the courtiers waiting curiously his reply. Lilimond still remained kneeling before the throne, and, as the King looked upon him he realized it would be impossible to break his royal word. And the affair promised him amusement after all, so he quickly decided in what manner to reply. "Rise, oh Prince," he said, cheerfully, "your request is granted. Upon what day will it please you to reign?" "Upon the seventh day from this," he answered. "So be it," returned the King. Then, turning to the royal herald he added, "Make proclamation throughout the kingdom that on the seventh day from this Prince Lilimond will reign as King from sunrise till sunset. And whoever dares to disobey his commands will be guilty of treason and shall be punished with death!" And some there were dressed in silken hose and velvet gowns, who, forgetting all shame, and, eager for gold, had been led by the Prince's offer to represent themselves as beggars, that they might add to their wealth without trouble or cost to themselves. "The more you can succor the greater will be your glory, and you will live in the hearts of your people as the kind Prince who relieved their sufferings. Be of good cheer, Your Majesty, for all is well." "Your Majesty," said the Treasurer, "if each of those who clamor without is to receive a piece of gold, there will not be enough within these coffers to go around. Some will receive and others be denied, since no further store of gold is to be had." "What are we to do?" he asked of the tutor; but Borland was unable to suggest a remedy. "Your Majesty, I think I can assist you in your difficulty. You did but promise a piece of gold to those who are really suffering and in need, but so great is the greed of mankind that many without are in no necessity whatever, but only seek to enrich themselves at your expense. Therefore I propose you examine carefully each case that presents itself, and unless the beggar is in need of alms turn him away empty-handed, as being a fraud and a charlatan." "Your counsel is wise, oh Chamberlain," replied the Prince, after a moment's thought; "and by turning away the impostors we shall have gold enough for the needy. Therefore bid the guards to admit the beggars one by one." "Since you are starving, go and sell the gold ring I see you are wearing upon your finger. I can assist only those who are unable to help themselves." At this the man turned away muttering angrily, and the courtiers murmured their approval of the Prince's wisdom. "What think you, Borland?" asked the Prince, anxiously, "have we done aright?" "I have learned, Your Majesty," answered the tutor, "that there is a great difference between those who beg and those who suffer for lack of bread. For, while all who needed aid were in truth beggars, not all the beggars needed aid; and hereafter I shall only give alms to those I know to be honestly in want." "It is wisely said, my friend," returned the Prince, "and I feel I was wrong to doubt the wisdom of my father's councilors. Go, Borland, and ask the King if he will graciously attend me here." "Forgive me, oh my King, that I presumed to doubt the wisdom of your rule. For, though the sun has not yet set, I feel that I am all unworthy to sit in your place, and so I willingly resign my power to your more skillful hands. And the coffers which I, in my ignorance, had determined to empty for the benefit of those unworthy, are still nearly full, and more than enough remains for the expenses of the carnival. Therefore forgive me, my father, and let me learn wisdom in the future from the justness of your rule." I wish all those in power were as kind-hearted as little Prince Lilimond, and as ready to help the needy, for then there would be more light hearts in the world, since it is "better to give than to receive." 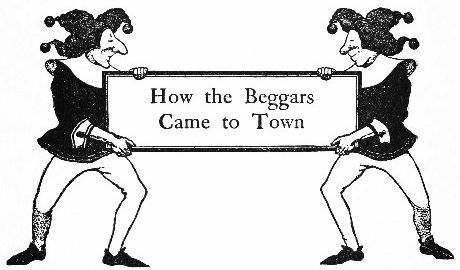 Add How The Beggars Came To Town to your own personal library.